Love and Revolutionary Greetings: An Ohio Boy in the Spanish Civil War (Eugene, Ore.: Resource Publications, 2012), by Laurie E. Levinger. 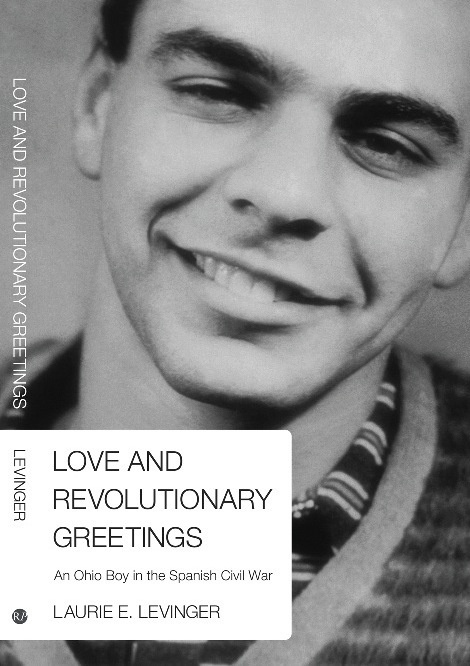 Love and Revolutionary Greetings tells the story of Sam Levinger, a young Jewish-American Socialist from Ohio who fought and died at the age of 20 in the Spanish Civil War. Based on war letters, poetry and writings by Levinger and biographical sketches by the soldier’s mother, this narrative takes us from the coal miners’ strikes in Ohio of the 1930s to the ruins of Belchite in 2010. At the heart of the story is a powerful reflection on the relationship between American activism and the Spanish Civil War and the meaning of memory in the present. In 2001, Sam’s niece, Laurie Levinger, stumbled upon a collection of poetry and letters written from the war front when her father was cleaning out his basement. Ten years later, she returned to the box, mulling over the physical record of her uncle’s life. The brittle, yellowed letters bridge yesterday and today offering an opportunity for reflection on American socialist projects of the 1930s and their meaning in the 21st century. The book traces Sam’s political origins. By the age of 17, he had adopted his parents’ commitment to social justice, joining in solidarity with coal miners in Ohio. In November 1936, after spending several nights in jail for picketing with the miners in one of the fiercest strikes of the period, he decided to postpone his studies in Sociology at Ohio State University and join the fight in the Spanish Civil War. The book follows Sam as he traverses geographic, cultural, linguistic and political boundaries. The novice soldier from Ohio soon became a “crack machine gunner,” fighting at Jarama and Brunete, where he was wounded. Sam died on September 6, 1937 in a field hospital in La Puebla de Híjar after being critically wounded at Belchite. Before he died, he wrote a letter to his parents (reproduced in the book in its original form), “I suppose that by the time you receive this, I will have been dead several weeks.” His letter reaffirms the depth of his love for his family and their shared socialist commitments. In the book’s final section, the author returns to Spain with her son after the death of her aunt Leah (Sam’s sister) in 2010. With Leah’s ashes, Laurie makes a pilgrimage to Aragón, searching tenaciously for Sam’s burial site. Following the war, the original Belchite was left in ruins — a ghost town — and a new Belchite was built nearby. Laurie returns to the “Silent Belchite,” and finds a small stone memorial for the Republican dead in the town cemetery. There, she places a small granite marker with Sam’s dates, thanks Sam for his courage and commitments, and scatters Leah’s ashes, uniting the siblings in the Spanish soil. Lisa DiGiovanni is Assistant Professor of Spanish at Indiana State University. Her areas of specialization include Spanish and Latin American literature and film.